Chris Parmelee enticed Twins fans in 2011 with a September audition during a lost season that seemed quite promising. In 76 at bats — a small sample size, as the kids like to say — Parmelee batted .355 with four home runs and an eye-popping 1.035 OPS. From 2012-14, however, Parmelee essentially had the same season three times. He never fell flat on his face, but he never grabbed a starting job and ran with it. He played some outfield and some first base, occasionally DHing as well. Each of those three seasons he had between 192 and 294 at-bats, and every season he finished with an OPS between .663 and .691. He was an adequate extra player and a rarity as a left-handed hitter: someone who hit righties and lefties pretty much equally. That’s nice if you’re a starter; it almost works against you as a bench player since you don’t offer any true advantage — just the threat of being constantly mediocre regardless of who is pitching. Three seasons was more than a reasonable audition. Last offseason, the Twins and Parmelee parted ways. He signed a minor league deal with the Orioles in January, one that included an invite to spring training. For some players, that’s the last gasp. If it doesn’t work out there, you either ride it out in the minors or hang it up for good. Parmelee didn’t make the big league club to start the year, but he went to Class AAA Norfolk and started raking. He was hitting .312 with solid power numbers when Baltimore called him up earlier this week. Who knows if that call-up was Parmelee’s last chance to prove he can stick in the majors, but at age 27 he’s not exactly a prospect anymore. It was, at the very least, an important moment in his career. And so far, Parmelee couldn’t really be doing more to justify he belongs. On Tuesday, he crushed two home runs in his Orioles debut, starting the game 4-for-4 and getting a standing ovation from the home crowd in a rout of Philadelphia. He continued his surge on Wednesday, homering in his first at-bat to help another Baltimore win. 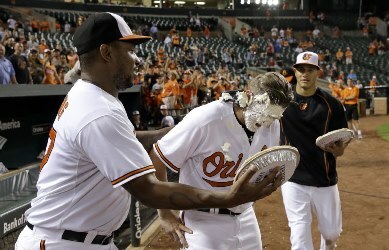 (Please enjoy that surreal AP photo of Delmon Young hitting Parmelee with a pie in the face). That’s three homers in two games, enough to prompt Baltimore fans to lose their minds and even joke about where to put a Parmelee statue. Two games, of course, is the smallest of small sample sizes. Twins fans have been on this ride before, and logic tells us the hot streak will gradually give way to so-so numbers. Then again, it is also possible that after close to 1,000 major league plate appearances, Parmelee is starting to figure things out. I’m not at all here to suggest the Twins should have kept Parmelee, even in light of their recent offensive woes. This is just the offering of kudos to a guy who could have been finished but instead is making the most — so far — of another opportunity earned.